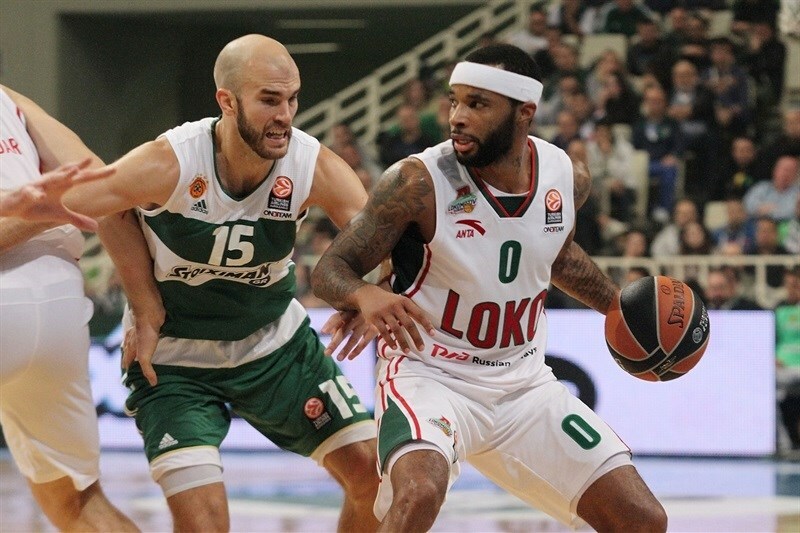 With Malcolm Delaney sizzling in the third quarter and Victor Claver making clutch baskets in the fourth, Lokomotiv Kuban Krasnodar pulled out a hard-fought 71-77 road win over the Panathinaikos Athens in the Greek capital on Friday night. Lokomotiv improved to 5-1 and a share of the first place of Group C, and needs only one more win to clinch a place in the Top 16. 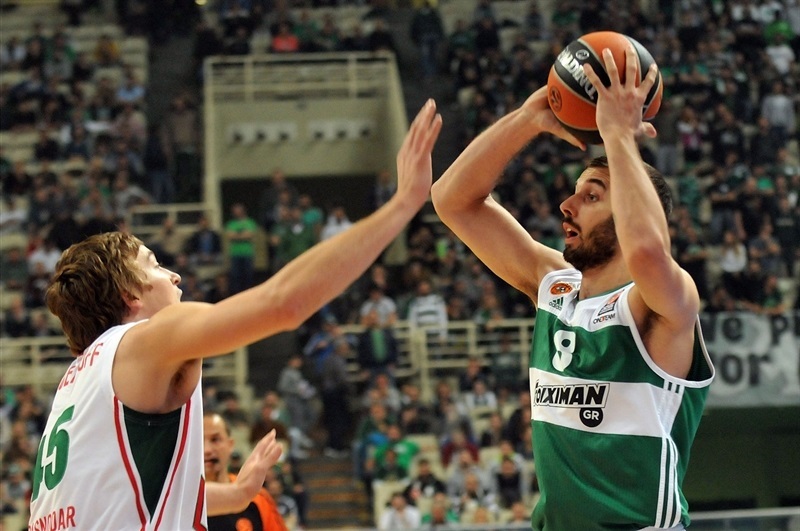 Panathinaikos suffered its first home loss and dropped to 2-4. 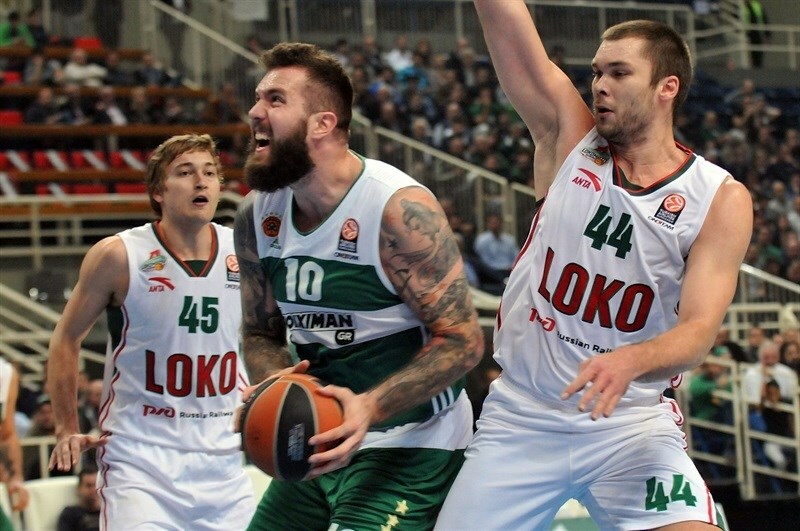 Lokomotiv started strong out of the gate, quickly building a double-digit margin, but the Greens rallied before halftime and went in front early in the third quarter. The teams traded leads from there as Delaney caught fire, scoring 20 points in less than 5 minutes. James Feldeine kept pace for the hosts and the game was tied 61-61 in the fourth quarter but Ryan Broekhoff hit an important three-pointer and Claver scored 9 points in the final 6 minutes to lift Lokomotiv to victory. Delaney finished with 23 points, 5 rebounds and 5 assists. Broekhoff netted 16, Claver finished with 13 plus 7 rebounds, and Dontaye Draper scored 10 in victory. 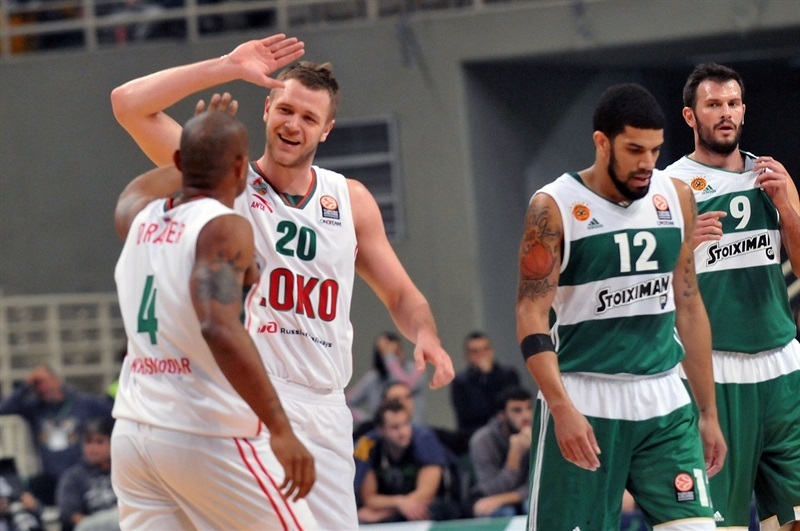 Feldeine paced the hosts with 14 points, Miroslav Raduljica and James Gist had 11 apiece, while Nick Calathes scored 10 along with 5 assists and 4 steals in a losing effort. Claver's free throws and a put-back from Kyrylo Fesenko got Lokomotiv started after tipoff. The visitors did not allow a single basket for 3 minutes, 30 seconds while Broekhoff nailed a triple to make it 0-7. A baseline basket from Vladimir Jankovic opened Panathinaikos's account, but Delaney fed Fesenko for a layup in traffi then kicked the pass out to Broekhoff for a triple from the right corner to make it 2-12. After a timeout, Broekhoff drove for a tough layup, but Dimitris Diamantidis dished an assist for Ognjen Kuzmic, who snapped a 2-14 Lokomotiv run with a big dunk. Gist added a put-back slam of his own before Kuzmic blasted a monster dunk off another Diamantidis assist, cutting the gap to 8-16. However, Chris Singleton scored an easy layup to re-establish the visitors' double-digit lead and Andrey Zubkov buried a shot from way downtown as Lokomotiv held a 10-21 advantage after 10 minutes. 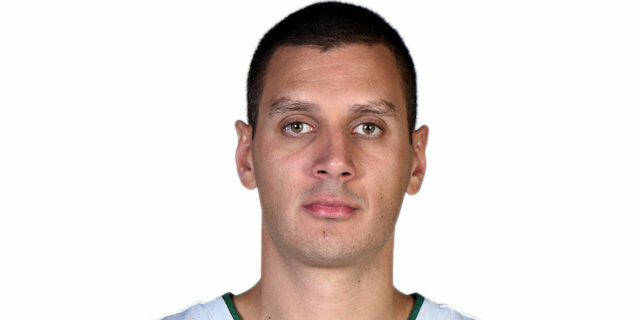 The second quarter saw a role reversal, now with Panathinaikos not allowing a single basket while Sasha Pavlovic made an easy dunk and Diamantidis an easy layup to help get the Greens within 15-21. It took Lokomotiv almost 4 minutes to score its first basket, a shot-clock-beating triple from near mid-court by Dontaye Draper. The same player hit another three-pointer on the next trip down the floor, and just like that opened a 15-27 Lokomotiv lead. After a timeout, Calathes assisted Jankovic twice, the second for a corner three-pointer that was his team's first of the night. 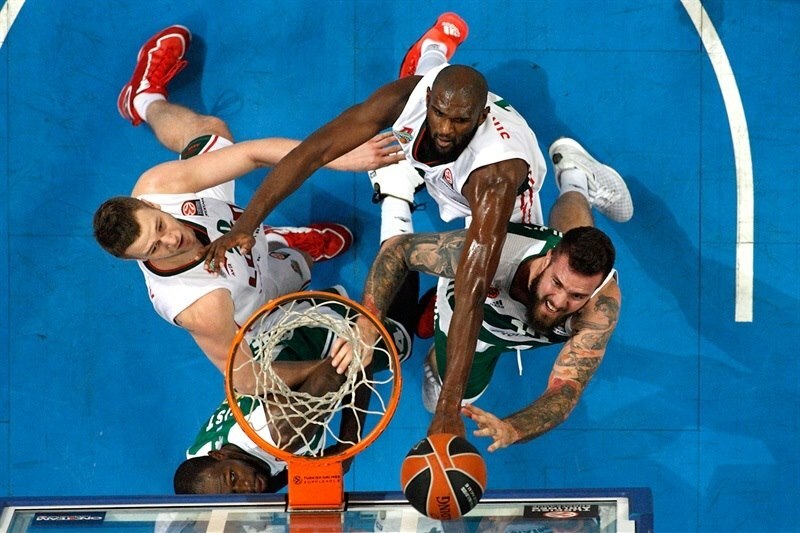 Panathinaikos stepped up its defensive pressure, and a pair of free throws each from Feldeine and Raduljica helped reduce the deficit to 24-27. Delaney dished his fifth assist by finding Draper for another triple, his third of the quarter, which snapped Panathinaikos's 9-0 run. But Feldeine made a pair of free throws before Calathes and Broekhoff traded three-pointers in the final minute of the half, making it 29-33 at the break. 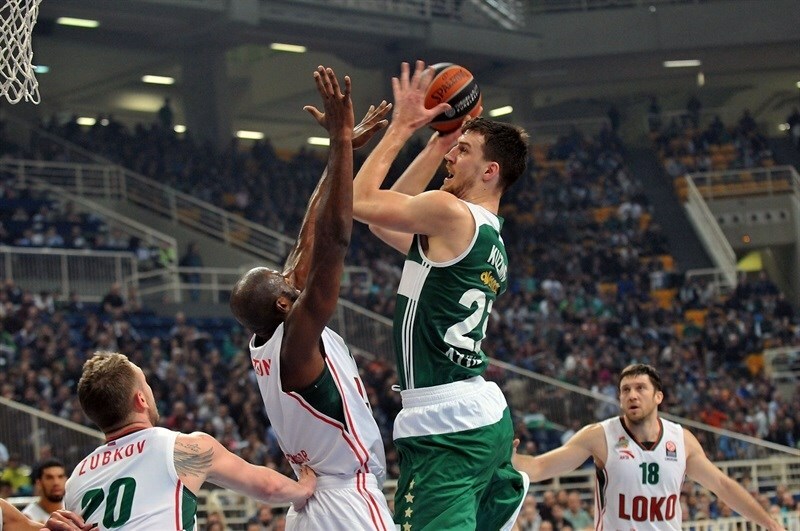 Calathes opened the third with a back-door reverse layup and Raduljica fought his way for a close-range basket to give Panathinaikos its first lead of the night. A three-pointer from Feldeine made it 37-33, before Singleton hit a jumper to snap the hosts' 8-0 run. Jankovic answered with an off-the-dribble jumper, but Lokomotiv stayed close with Delaney’s 2 free throws, his first points in the contest, at 39-37 with 5 minutes left in the third. Kuzmic scored inside, but Delaney bettered it with a three-pointer. Pavlovic drove for a dunk, but Delaney continued his run by driving for a layup-plus-foul to tie at 43-43. Broekhoff drove an open lane for a go-ahead dunk and Delaney followed with a four-point player on a triple-plus-free throw combo, extending Lokomotiv's edge to 44-49. Feldeine hit a triple for the hosts, and after Zubkov scored inside, Feldeine hit another three to get Panathinaikos within 50-51. However, Delaney anwered with his third triple, and after free throws from Diamantidis, he made another from the arc. The same player added 2 more free throws to push his personal tally to 20 points in the third quarter. Calathes finished the quarter by going coast-to-coast for a floater that made the score 54-59 after 30 minutes. Free throws from Raduljica and a triple from Calathes forged a 59-59 to start the final quarter. Delaney drove for a layup, but Gist elevated for a reverse on the other end. A corner triple from Broekhoff and a pair of foul shots from Singleton gave Lokomotiv some breathing room at 61-67 with 6 minutes to go. Gist answered with a three-pointer, but Claver tipped in Singleton’s reverse layup attempt, then followed it with a three-pointer at 64-72. After foul shots from Gist, Claver made a steal and scored on a breakaway. 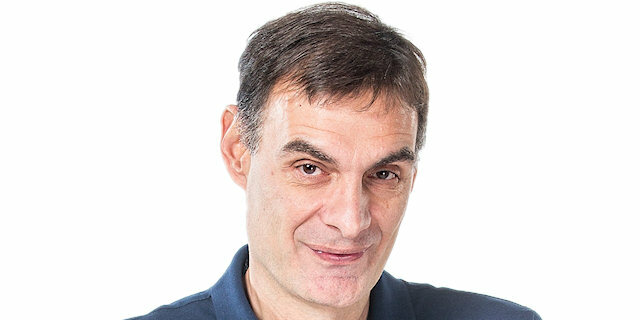 Gist responded from close range, reducing the gap to 68-74 with 2 minutes left, but all the hosts managed in the next 90 seconds was a single free throw from Raduljica. With 30 seconds left, Claver grabbed a key offensive rebound, drew a foul and hit 2 free throws, making it 69-76 and sealing the deal. 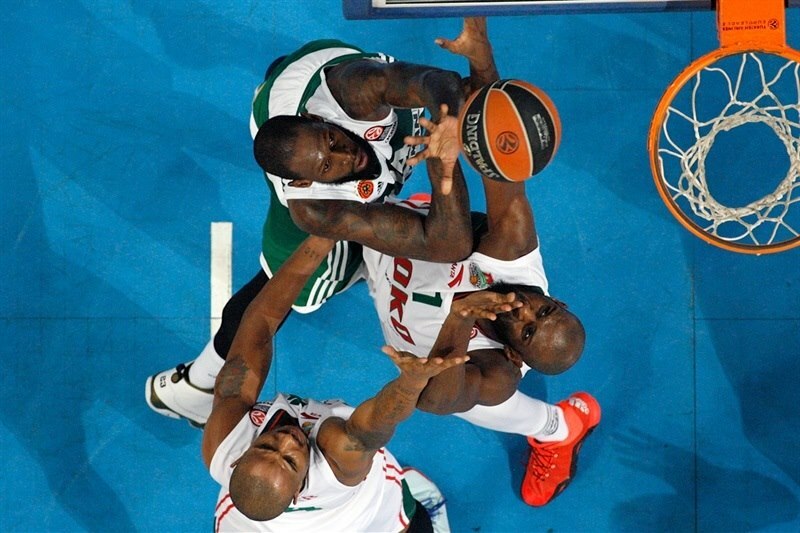 "Congratulations to Lokomotiv Kuban, because the proved from the very first moment that they wanted this victory. For us, it is a tough loss and a tough night we have to manage. We lacked our defensive spirit and made stupid turnovers, especially in the first period. In such a game, every ball possession is important. Now we have to stay together and get prepared for the next game which is very crucial. 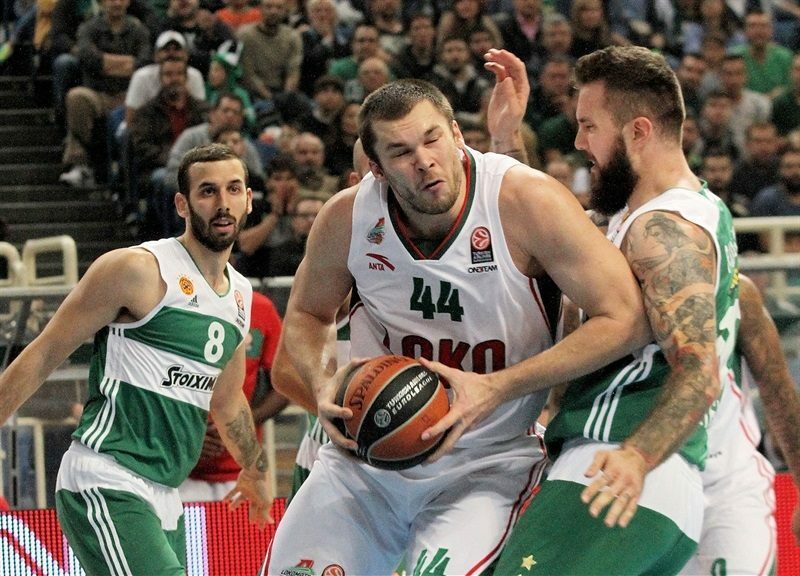 Lokomotiv Kuban has very good ball-handlers, while Delaney has lots of talent and there is no doubt that he is one of the greatest players in the Euroleague. We tried to stop him and it worked out in the first half. Then he came up big and scored big three-pointers against our defensive rotations. 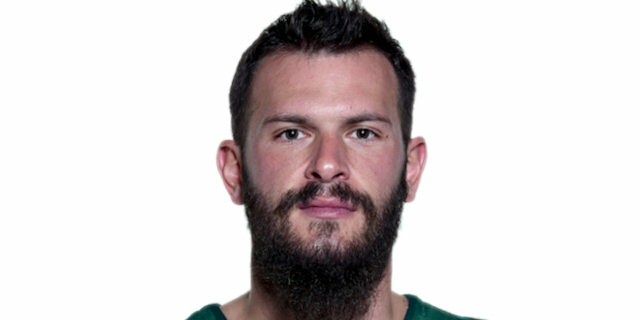 Unfortunately, Nick Calathes was in foul trouble and was unable to defend him." "It is a tough defeat to a very good team. To lose is always painful, especially if it happens at home. 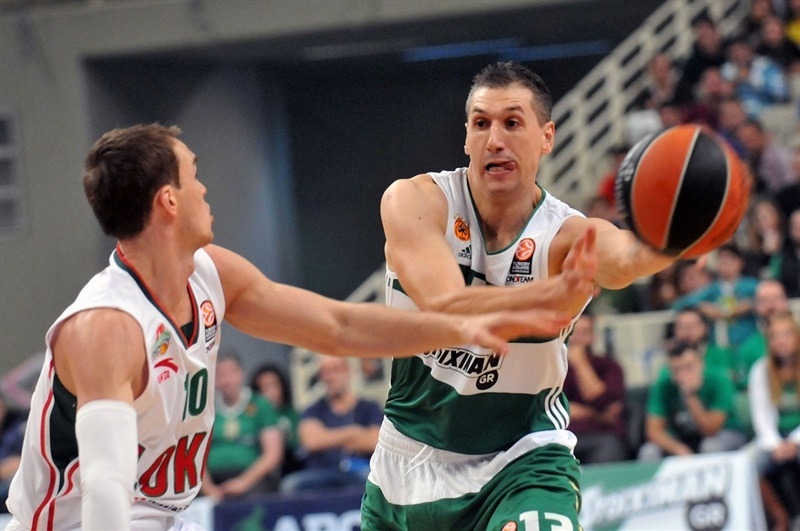 However, we have to learn from our mistakes and try to beat Karsiyaka next week." "It was a crucial game for us, but unfortunately we lost it. 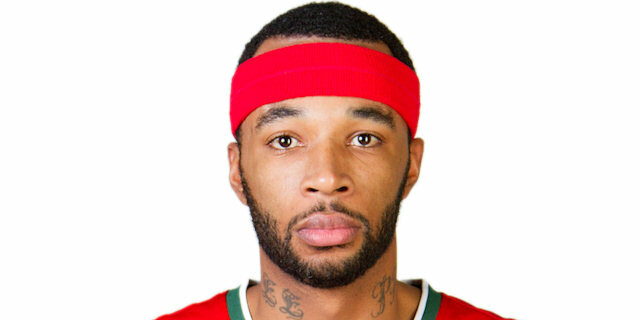 Lokomotiv Kuban is a very good team and they took advantage of all our mistakes, either on defense or offense. They made some big shots and we didn't manage to stop Delaney in the third quarter. We have to improve our game, especially on defense, and I am looking forward in playing much beter next week in Izmir. It is the right time to play well and win a road game "
"I was very disappointed after we lost to Barcelona, especially because I missed some free throw there, but we came back tonight and had a big win. In the first half I didn't score, but my teammates played great. Then it was my turn to find the path to the basket. My shooting was really terrible in the first half and I was waiting to find an opportunity to bounce back. Fortunately, it happened in the second half with two free throws and I found my rhythm and did my job."